Continue reading to get to know more about her and the intention behind what she does! A: I'm Keitha Cloudt and my business is Keitha's Artful Garden. My family moved from the Atlanta, Georgia, metro area almost 10 years ago. We were seeking a slower-paced, more natural and self-sustainable lifestyle, and God sat us down in beautiful Sedalia, Virginia! With a big move like that, you miss friends and family, but I felt at home from the beginning. I was born in western North Carolina and lived there until I was 18. When my mom first visited Sedalia, she said, “You can't take the mountains out of a mountain girl or the country out of a country girl.” It took 30 years, but this girl made it back! Q: What kind of products do you make? Why do you make them? A: Since being here, I have been learning and trying to incorporate more natural goodness into our lives. Gardening and canning — things I helped with as a youth but now am learning to do on my own. One of my dreams (goals) was to have the Artful Garden business (a fusion of nature, food and artisan miscellany). 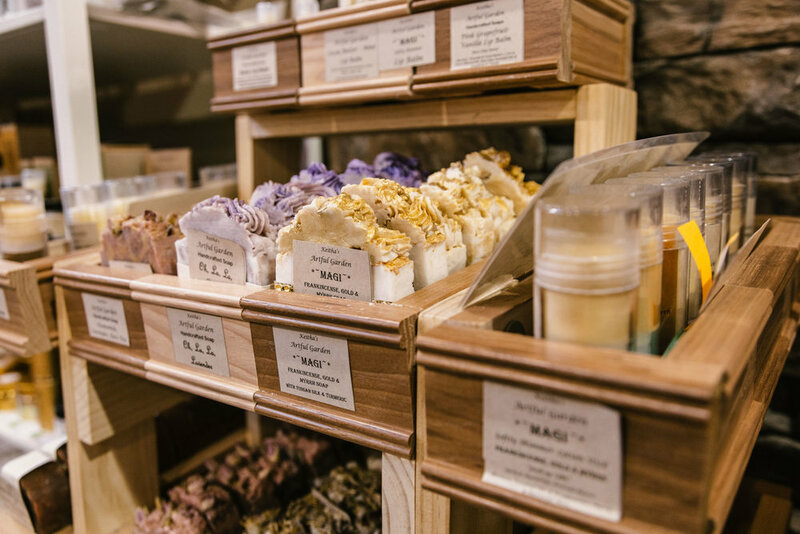 There are many aspects of it that will come about as time goes on, but this year, I kicked it off with the natural soaps, solid lotions and lip balms, some of the artisan miscellany. For many years I purchased more natural soaps and cleaning products (when I could find them) because of skin sensitivities in my family. That lead into making my own products that are free of petroleums, chemicals, detergents, SLS, and phthalates. Not only do I want my products to be pure and good but also artistic and aromatic. The Chamomile, Lavender, Rose Tea Infused soap was inspired by the tea and developed into a beautiful pink, purple, and yellow swirled soap topped with the floral tea and scented with the coordinating essential oils. I made the Rain Washed Woods soap because I needed a good moisturizing "scrub-up" soap to cleanse away garden dirt and stains. It contains activated charcoal and ground loofah. A: My Artful Garden products have the purpose of wellness: the wellness that comes from daily simple things we do to weave the tapestry of of a good life and legacy — the wellness of mind, body, and spirit. Do I believe a good bar of soap can be a thread in that life tapestry? Yes, I do. God's creation has everything we need for well-being. I am constantly searching for the best pure and natural ingredients I can get for my products. 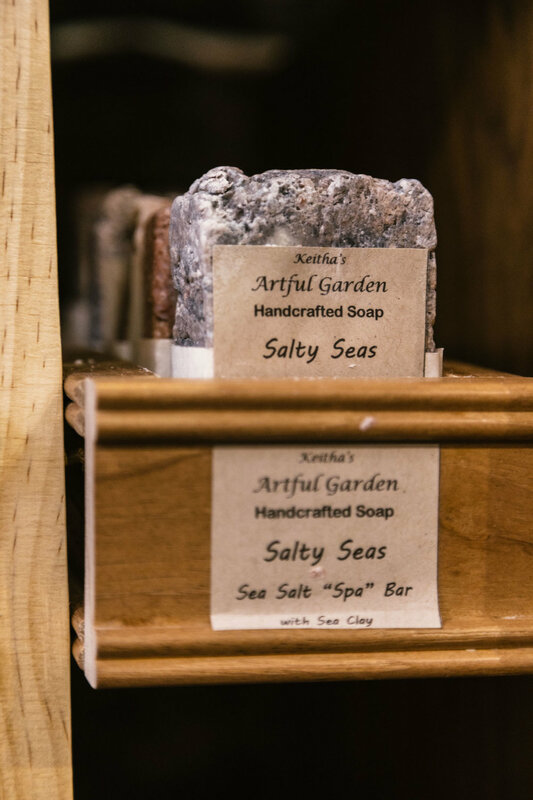 Skin-loving natural oils and butters, aromatic essential oils, clays provide natural colors and "slip" to the soap as well as draw impurities out of the skin and help hold the scent in the bar. I also use other natural additives such as micas for color and shimmer, activated charcoal for color and detox, spices for color and scent, Tussah silk (cruelty-free) in some some soaps and in the shampoo and conditioner bars, teas, and kombucha. Loofah, ground walnut shells, coffee, and salts are used for exfoliation. I decorate many of my products with botanicals and other items such as ground walnut shells, Himalayan salt, and frankincense tears (Magi Soap). My products are made in small batches and tested on myself and my dear family and friends. A: Our skin is our biggest organ, it is important to be mindful of the products we use because they are absorbed into our body and affect our body's systems. Vendor Q&A: Get to Know Good Karma Tea Co.